This 45 pint electronic dehumidifier keeps the moisture in your home to a minimum! 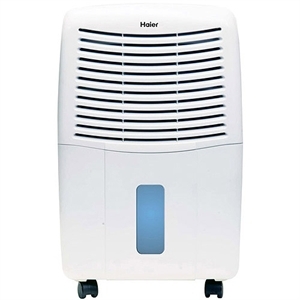 Haier's 45 Pint Electronic Dehumidifier keeps the moisture in your home to a minimum. Which helps alleviate conditions that can lead to problems like mold & interior damage. This model features electronic controls with a digital humidistat and the smart-dry auto-adjusting fan. Energy Star Product! Smart-Dry feature chooses the appropiate setting automatically by comparing the humidity level set on the unit and the relative humidity in the room to adjust the fan accordingly.